In Greenville last week I stopped at the Audie Murphy/American Cotton Museum. 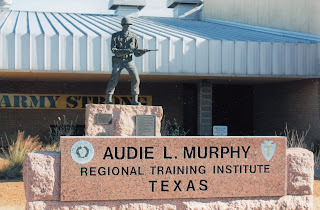 A few years ago, while working on a book entitled East Texas in World War II, I researched Audie Murphy in this museum. There is an imposing statue of Murphy - based on one of his combat exploits - on the approach to the museum. Audie Leon Murphy was born on June 20, 1924 (or 1925) on a farm north of Greenville. He was the sixth of 12 children. His father was a sharecropper who deserted his poverty-stricken family in 1936. Audie's mother tried to hold her children together, and there were numerous moves around the area, once into an abandoned boxcar. Dropping out of school, Audie worked on farms for a dollar a day - when he could find employment. He hunted the woods for rabbits and squirrels, developing a feel for terrain. Hunting with a single-shot .22 rifle, Audie became a crack shot - if he missed, there was no meat in the family pot. Audie's mother died in 1941. Audie found a job at a gas station in Greenville, while younger siblings were placed in Boles Children's Home, a Christian orphanage in Quinlan. After the attack on Pearl Harbor Audie tried to enlist, but he was underage and - at 5'5' and 110 pounds - undersized. But on his 18th (or 17th!) birthday in 1942 Audie was accepted by the U.S.Army, enlisting at Greenville's Post Office, which still stands just west of downtown. He fought with courage and skill in Sicily, Italy, France, and Germany, suffering three wounds and taking part in amphibious assaults in Sicily and southern France. Awarded a battlefield commission, Lt. Audie Murphy won the Medal of Honor during an action near Holtzwihr, France, on January 26, 1945. Murphy's Company B was attacked by six tanks and a large infantry force. Ordering his men to return to prepared positions in nearby woods, Lieutenant Murphy remained forward while giving fire directions to artillery by telephone. Many advancing Germans halted, but the enemy tanks lumbered toward his position. Murphy climbed on a burning tank destroyer, which had been disabled by a shell and was in danger of blowing up, but Murphy manned the .50 caliber machine gun and turned the attack, mowing down an enemy squad that crept within 10 yards of him. Exposed atop the destroyer, he was wounded in the leg but killed or wounded 50 Germans. Refusing medical attention, Murphy organized a counterattack against the retreating Germans. The most decorated American soldier of World War II, Murphy was presented 33 awards, including every medal the United States offers for valor - two of them twice. After the war, Murphy was invited for a long stay at the Hollywood home of movie star James Cagney. Pursuing a movie career, Murphy starred in Westerns, and in the 1956 hit To Hell and Back, the story of his combat career. For several years, he simultaneously served the Texas National Guard. 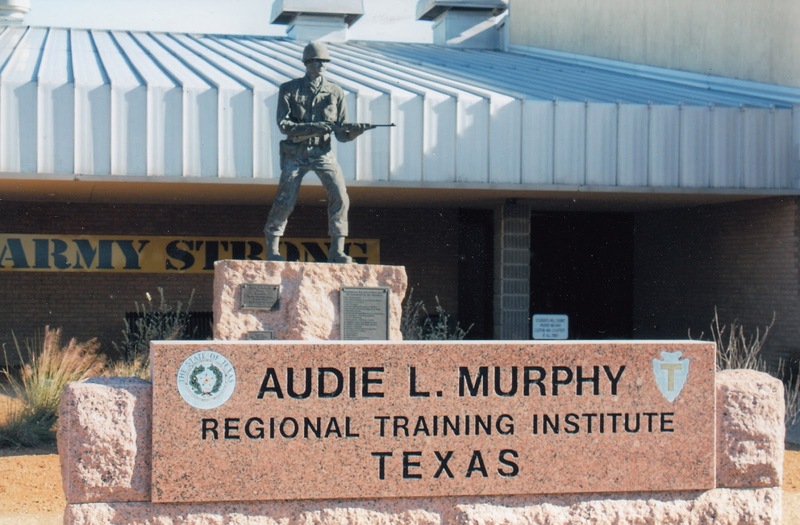 In 1953, during the Korean War, Captain Murphy worked as a firearms instructor with members of the 36th Division T-Patchers ("The Texas Army"). Murphy hoped to accompany them to Korea, but the division was not deployed. Although promoted to major, Murphy concentrated on his film career. At 46 in 1971, he was killed in a plane crash and buried with full military honors at Arlington National Cemetery. center at Camp Mabry in Austin. After leaving McKinney I soon passed through Floyd, driving past the old school building which Audie attended briefly. Within a few minutes I reached Farmersville, where Audie's mother died, where his older sister lived with her family, and where a grand parade was staged in his honor at war's end (the downtown area looks much as it did in the parade photos). Three days later I returned by a more northerly route, driving through Celeste, where Audie went to elementary school. On the outskirts of town is a handsome memorial, and a few miles south an historical marker indicates the site of his rural birthplace. 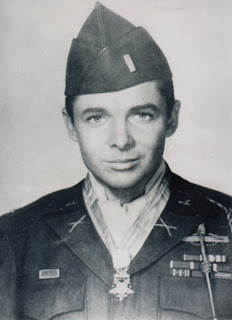 The Greenville-Farmersville-Celeste area offers significant remnants of Audie Murphy's formative years. This week I stopped by McKinney to visit the North Texas History Center and Chestnut Square, a collection of historic buildings. I had not been to Chestnut Square in many years, and I was eager to see improvements and additions. I was welcomed by Cindy Johnson, Executive Director of Chestnut Square Historic Village, and by several delightful staff members. Cookbook in the museum gift shop. Historic architecture is our most tangible reminder of the past, and the eight structures clustered at Chestnut Square span the time period of 1854 to 1918. The oldest building is the 1854 Faires House. The "Two-Bit" Taylor Inn was built about a decade later, and earned its nickname because the proprietor charged overnight guests 25 cents. The two-story John Johnson house was erected in 1874, and the one-and-a-half story Dulaney Cottage went up the following year. A steepled frame church was built at the turn of the century, and weddings are held in this Chestnut Square "Chapel." The most substantial residence is the Dulaney House, erected in 1916 and much more spacious than the 1875 Dulaney Cottage. The 1918 Brimer-Anderson Grocery is widely known as "Dixie's Store." And there is a white frame replica of the J.B. Wilmeth Schoolhouse, the first free school in Collin County. These buildings are filled with period furnishings, and guided tours provide rich steps back into the past. Furthermore, regular events are staged. On Saturday, February 23, there will be a fashion show and tea luncheon, featuring vintage fashions from the 1850s through the 1930s. Later in the year will be Civil War Days, the annual Ice Cream Crank-Off, a Prairie Adventure Camp, a Pre-K Pumpkin Patch (in October, of course), the Legends of McKinney Ghost Walk, a Holiday Tour of Homes, and other events. Three blocks north of Chestnut Square, the North Texas History Center is located in McKinney's 1911 Post Office Building. The North Texas History Center is operated by the Collin County Historical Society. The galleries exhibit a rich collection of artifacts and historic photographs. The Archives Room houses historical documents, interviews, and more photographs. A classroom is upstairs. I was shown the museum by Vicki Day, the vivacious director of the Collin County Historical Society. When I arrived Vicki was leading preparations for the upcoming "Pieces of the Past" Historic Quilt Exhibition. The two-month exhibition of the art of hand quilting opens January 31 and will continue through March 23. The museum will be open on Thursdays, Fridays, and Saturdays, 11 AM to 4 PM through the duration of the show. 1911 Post Office now is a museum. While in McKinney the historic courthouse square should be visited. The vibrant square teems with shops and restaurants, and the North Texas History Center and Chestnut Square Historic Village are only a couple of blocks away. Elsewhere around town are handsome residences and churches from bygone eras. The historic-minded traveler will be richly rewarded by a day in McKinney. On Friday night, January 18, it was my pleasure to address the Marshall chapter of the United Daughters of the Confederacy. The occasion was the chapter's annual banquet, which was held at Pinecrest Country Club in Longview. The banquet was timed to coincide with the birthdates of Confederate icons Robert E. Lee (born on January 19, 1807) and Stonewall Jackson (born on January 21, 1824). The program was arranged by Liz Hedges, a longtime friend and former colleague of mine at Panola College, where she was head of the drama department. Liz asked me to provide a program on Lee and Jackson, which I was pleased to put together. And while relating Lee's background I happily pointed out that he was on duty in Texas on three occasions. My interest in Lee began at age six, when I started school at Robert E. Lee Elementary in Corsicana. Inside the main entrance was a large portrait of Lee, resplendent in dress uniform, red sash, and sword. In later years I twice visited Stratford Hall, the magnificent colonial home where Lee was born. I've toured battlefields where Lee and Jackson led large numbers of men in combat. I've accompanied Panola College students to Appomattox, where Lee surrendered. And I've toured the Texas outposts - most on several occasions - where Lee served with federal forces. Stonewall Jackson wore a kepi pulled low. During the war with Mexico, Captain Lee marched into Texas with the U.S. Army. In 1846 Lee was at San Antonio, Rio Grande City, and Eagle Pass, before campaigning in Mexico. In 1855 he returned to Texas as Lieutenant Colonel Lee of the newly-organized Second Cavalry, which was formed to combat horse Indians of Texas, Comanches and Kiowas. During the next couple of years he was stationed at San Antonio, Fort Mason, and Camp Cooper, although patrols he led and six court-martial tours took him to many other outposts on the Texas frontier. He became friendly with pioneer cattleman Richard King, who asked the former member of the Corps of Engineers to select a site for his ranch home. An excellent judge of terrain, Lee found a site which still serves as headquarters for the King Ranch. In 1857 Lee's father-in-law died, and the officer took an extended leave to settle the family estate. Lee still was in the East in October 1859 when John Brown raided the armory at Harper's Ferry, and he led the assault on Brown's position. Soon Lee was promoted to Colonel of the Second Cavalry, and in February 1860 he arrived in Texas to take command of his regiment. One year later, during the secession crisis, Colonel Lee was summoned to Washington D.C., where he was offered command of the Union Army. Declining to invade his home state, Lee resigned his commission, and within days he was commissioned a general in the Confederate Army. During the ensuing Civil War, General Lee always wanted as many "Texas boys" as possible under his command - in Mexico and in Texas he had witnessed the superb fighting qualities of Texans. During Lee's three tours of duty in Texas, he either was stationed at or visited Forts Brown, Ringgold, Phantom Hill. Chadbourne, Inge, Mason, Camp Cooper, as well as other posts. The oldest building at Fort Clark is a picket structure where Lt. Col. Lee conducted courts martial. At most of the other forts, buildings still stand which Lee once knew. In Texas it is possible to walk in the footsteps of Robert E. Lee of the United States Army. Throughout the month of January 2013, Panola College in Carthage is celebrating its 65th anniversary. Actually, Panola County Junior College was approved, by county voters and by the state, and organized during 1947. But classes were first held in the spring semester of 1948. During January 1948 - 65 years ago this month - registration was first conducted and classroom instruction began. On January 7, 2013, a standing-room crowd gathered in the assembly room of the library building on the Panola College campus. Those present included former students and faculty members, current faculty members, and supportive citizens from the community. Dr. Greg Powell, Panola College president, welcomed the crowd and introduced the speakers. Dr. Powell asked me to read a congratulatory proclamation from Gov. Rick Perry. I then provided a 10-minute presentation about the first few years of Panola County Junior College. I based these remarks on a book I had written, Panola College, 1947-1997, The First Half Century. The next speaker was Bev Brown, retired owner-manager of KGAS Radio in Carthage. On January 19, 1948, Bev waded through eight inches of snow to register for a night class at Panola County Junior College. He informed us that he lost a pair of galoshes during the snowstorm that greeted the original PCJC students. In 1966 Bev joined the college board of trustees, and for 18 years he was one of the most progressive board members in the history of the institution. Carson married pretty Pony cheerleader, Dixie Arnold from Carthage. A fervent supporter of the junior college, Carson has served as mayor for two decades. Mayor Joines summoned President Greg Powell to the speaker's stand, read a proclamation honoring the college's importance to Carthage, and presented Dr. Powell with a key to the city. Dr. Powell focused upon present accomplishments of Panola College, and offered a glimpse of the future. Panola has enjoyed 10 consecutive semesters of record growth, and current enrollments exceed 2,500 students. Last year Panola experienced the fastest rate of growth of any institution of higher learning in Texas. Panola regularly is selected as a Top Ten Digital College, and recently was added to the list of Great Colleges to Work For honor roll. Whereas the early decades of Panola College witnessed a predominance of men in the student body, today women comprise 68 percent of enrollment. Because of the growth of the student body, a new dormitory is under construction, and further physical expansion is being planned. The program was broadcast over KGAS Radio and covered by Panola alum Elaine McPherson for the Panola Watchman. Afterward the crowd enjoyed cake and punch and favors, while socializing and touring the superbly nostalgic display in the libary gallery. There were students present from the first year of PCJC, when the only buildings were flimsy structures brought to Carthage from World War II army camps at Tyler and Greenville. The 55 students who enrolled in the spring of 1948 expanded to 185 in the fall of 1948, and the little college was off and running. Today, 65 years later, there is a modern physical plant in Carthage, as well as Panola College satellite campuses in Marshall and Center. There are strong ties between the college and a large alumni base from Carthage and nearby rural communities. Berri was the cheerleader mascot (note display below). Dr. Powell and I will appear together on "Panola Pride," a 30-minute daily program over KGAS Radio. We will be on-air Thursday morning, January 17. And during this anniversary year we will embrace any other opportunity to relate the founding story of PCJC and to promote the future of Panola College. On January 2, while traveling to Waco for a speaking engagement, my wife Karon and I stopped in Hubbard for a visit to the city museum. The Hubbard Museum is housed in the 1914 high school building. Indeed, for those interested in historical architecture, the museum is worth a tour to view the handsome exterior and the interesting interior layout and architectural features. I've been familiar with the building since it served as a high school, and after it became a museum I've toured it twice. But it has been several years since my last visit, and I'd heard that there have been considerable improvements. Karon and I were greeted by Librarian Linda Jordan and museum volunteer Sue Leathers, who attended Hubbard High School in the museum building. Linda and Sue informed us that the museum indeed had obtained grants which fostered the conversion of various rooms into display areas. There is a spacious library on the main floor, while the basement now houses an excellent genealogical library and museum. There is a superb antique doll display, from the extensive collection of Berta Leon Hackney, a former mayor of Hubbard. The dolls are arrayed in cases that Berta purchased at Neiman Marcus in Dallas. Other former classrooms on the three levels exhibit aspects of the past of "Hubbard City." There had been a rural community in the vicinity for two decades before Cotton Belt Railroad tracks appeared in 1881. A townsite was laid out, and with former Texas governor Richard Hubbard present, it was decided to name the new town Hubbard City. Another railroad soon made a connection, spurring the growth of Hubbard City. Victorian houses were built all over town, and a large number still stand. Ornate commercial buildings were erected, but a tornado felled the best turreted structures in 1973. By the 1920s the population exceeded 2,700, but there was a sharp decline during the Depression of the 1930s. J. Frank Norris was raised in Hubbard City, before leaving in 1898 for Baylor and a controversial career as a fundamentalist Baptist preacher. Hiram Wesley Evans also graduated from Hubbard High School in 1898, and he later achieved notoriety as the Imperial Wizard of the Ku Klux Klan. The 1914 Study Hall boasted a pressed tin ceiling. Hubbard's most famous native son is Tris Speaker. Born in 1888, by the time he was a teenager he was playing on Hubbard's town team. When he was 18 he was signed as a pitcher by the Cleburne Railroaders of the Texas League. He was ineffective on the mound, but as an outfielder he showed exceptional speed, while hitting the ball with power. With Houston in 1907 he won the Texas League batting title, and soon he was in the big leagues. During a 22-year major league career he compiled a .345 batting average. He was a spectacular center fielder, and he was the American League's Most Valuable Player of 1920 with a .388 average. That year he was player-manager of the Cleveland Indians, leading them to the pennant and a World Series triumph. Speaker's record for doubles in a career, 793, still stands as a lifetime mark, along with several fielding records. Tris Speaker was the seventh - and first Texan - inducted into the Baseball Hall of Fame, and he was the first athlete voted into the Texas Sports Hall of Fame. Following his death by a heart attack in 1958, Speaker was buried in Hubbard's Fairview Cemetery. Speaker's career is chronicled in the Hubbard Museum, and his niece Tris Speaker Scott, frequently serves as docent. This excellent museum is open on Wednesdays 10-4, and Saturdays, 10-5. My first speaking engagement of 2013 was on January 3 in Waco. I addressed members and guests of the Sterling C. Robertson Chapter of the Daughters of the Republic of Texas. The chapter president is Amelia Bogard, a vivacious woman who energetically advertised this meeting in Waco and surrounding communities. The crowd was gracious and receptive, and a number of additional chairs had to be brought into the library's meeting room. My sister, Judy O'Neal Smith, is a past president of the Lampasas chapter of the DRT. Judy recently facilitated the application of my daughters for membership in the DRT. Judy came to Waco for the meeting, and so did two of my daughters, Lynn O'Neal Martinez of Mansfield and Berri O'Neal Gormley of Irving. Lynn and Berri had received their membership papers a few days earlier, and I was proud that I would be the speaker at their first DRT meeting. Lynn brought her two daughters, Chloe and Jessie - who are future DRT members - and my wife Karon was part of our group. When President Bogard introduced me, she announced that I had brought my own crowd! A few weeks ago my most recent book was released: Lampasas, 1855-1895, Biography of a Frontier Texas Town. For the introductory event in Lampasas I prepared a program about the frontier decades of the community: Comanche raids, saloon shootouts, a blood feud, stock theft, lynchings, stagecoach robberies, and conflict between cattlemen and sheepherders. During this program preparation I realized that I had included in the book a considerable amount of material from women pioneers. I soon began preparing a program on the frontier experiences of Lampasas women, and the DRT meeting in Waco would be my first opportunity to present this program to an audience of history-minded women. I quoted to the audience the venerable saying that "Texas is hell on horses and women." Horses had to deal with the vast distances of Texas, while pioneer women had to endure isolation, hardship, and mortal danger to themselves and their children. For nearly three decades Lampasas bristled with hardships and dangers, and women left behind a number of first-person accounts. My program about them is suitable for DRT meetings, because the organization was formed to perpetuate "forever" the memory of the heroic pioneers of the Republic of Texas by their descendants. On November 6, 1891, 16 ladies met at the Houston home of Mrs. Andrew Briscoe and formed the "Daughters of the Lone Star Republic." Mrs. Anson B. Jones, widow of the last president of the Texas Republic, was elected president of the new group. A committee was appointed to draw up a constitution and by-laws, and two ladies were delegated to design a star-shaped emblem. By this time Lampasas had become a resort town known as the "Saratoga of the South." Arrival of a railroad ended the long frontier period and provided tourists access to the mineral springs of Lampasas. The Texas Veterans Association scheduled a statewide convention in Lampasas in April 1892, holding their meetings in the ornate Lampasas courthouse. The newly-organized Daughters of the Lone Star Republic accompanied the Texas Veterans to Lampasas. On April 21, at the end of the second day of joint sessions, the ladies left the courthouse and walked two blocks to the First Methodist Church. With Mrs. Anson Jones presiding, the ladies voted to change the name of their organization to the Daughters of the Republic of Texas. The DRT grew rapidly. Encouraging research and the preservation of records and artifacts and buildings, the DRT most famously assumed stewardship of the Alamo. The DRT holds a state-wide meeting each spring, and I was privileged to serve as keynote speaker a few years ago. The state's oldest patriotic society for women, the Daughters of the Republic of Texas today boasts 106 chapters. There is no more appropriate and pleasurable way for the State Historian of Texas to begin a new year than by meeting with a DRT chapter.